WIN WIN WIN!!!!! WIN VIP MOVIE PREMIERES, MOVIE INVITES and DVD's--read below!!! BATV is hosting a week-long online promotional giveaway (from 5/31 to 6/7) for Walt Disney Animation Studios’ upcoming in-home release of ZOOTOPIA, available on Digital HD, Blu-ray™, Disney Movies Anywhere, DVD and On-Demand on Tuesday, June 7th and featuring an exciting lineup of bonus features including candid conversations with filmmakers and artists behind Zootopia, an alternate opening, never-before-seen characters and deleted scenes and a sneak peek at some of the hidden Easter Eggs that make reference to Disney Animation’s most beloved films and characters. Explore more of Zootopia with an exciting lineup of bonus features! BURBANK, Calif., April 29, 2016 — Walt Disney Animation Studios’ (WDAS) comedy-adventure, “Zootopia” has broken records worldwide earning more than $900 million at the global box office to date. The best reviewed movie of 2016, critics and audiences around the world have fallen in love with the wonderfully innovative animal metropolis of “Zootopia” and the comedic chemistry of rookie rabbit officer Judy Hopps (Ginnifer Goodwin) and scam-artist fox Nick Wilde (Jason Bateman). It’s been called one of the best buddy cop comedies in years! Thankfully, there’s more—much more. When the runaway hit arrives home on Digital HD, Blu-ray™, Disney Movies Anywhere, DVD and On-Demand (does not include bonus) platforms June 7, 2016, viewers will not only be able to enjoy the vibrant world of Zootopia and reunite with their favorite characters, but also discover more about the evolution of this extraordinary tale through in-depth bonus offerings. The Origin of an Animal Tale – Follow the story’s development from its origins to a big story shift that turned the film upside down. In this documentary, filmmakers give a candid look into the difficulties of creating the story of Zootopia and the bold decision to switch the main character late in the production process, putting one resolute rabbit center stage. International Character Reel - See the variances in news reporters in Zootopia around the world! Directed by Byron Howard (“Tangled,” “Bolt”) and Rich Moore (“Wreck-It Ralph,” “The Simpsons”) and produced by Clark Spencer (“Wreck-It-Ralph,” “Lilo & Stitch”), the progressive mammal metropolis of Zootopia is a melting pot where animals from every habitat live side by side and "anyone can be anything." But when new rabbit police officer Judy Hopps (voice of Ginnifer Goodwin) arrives in town she discovers that being the first bunny on a police force of tough, hulking animals isn't so easy. Determined to prove herself, she jumps at the opportunity to crack an unsolved, challenging case even if it means working with a fast-talking, scam-artist fox, Nick Wilde (voice of Jason Bateman), to solve the mystery. But the case leads these two unlikely partners to an uneasy conclusion that Zootopia’s "evolved" society is being pulled apart by unseen forces determined to use fear to take control of the city by turning predators and prey against each other. 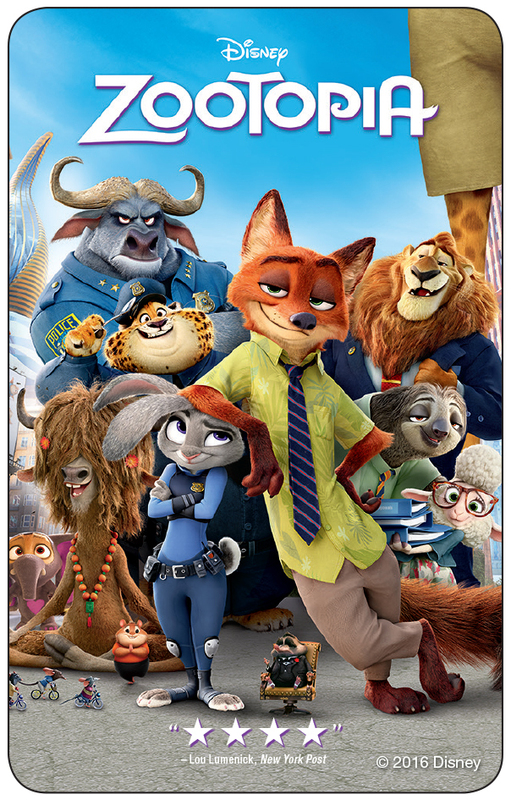 Others who helped bring the world of Zootopia to life, include a remarkable roster of voice talent including Idris Elba (BBC’s “Luther,” Golden Globe®-nominated for Netflix’s “Beasts of No Nation”) as Judy’s no-nonsense cape buffalo boss Chief Bogo, Jenny Slate (“Obvious Child,” “Marcel the Shell”) as Assistant Mayor Bellwether, Nate Torrence (HBO’s “Hello Ladies,” Fox’s “Weird Loners”) as charming cheetah Clawhauser, Bonnie Hunt (“Return to Me,” “Jerry Maguire”) and Don Lake (“Dumb and Dumber To,” “The Bonnie Hunt Show”) as Judy’s anxious, but supportive parents, Tommy Chong (“Up in Smoke,” “That ’70s Show”) as Yax the Yak, J.K. Simmons (“Juno,” Oscar® winner for “Whiplash”) as Mayor Lionheart, Octavia Spencer (“Insurgent,” Oscar® winner for “The Help”) as the distraught Mrs. Otterton, Alan Tudyk (“Rogue One: A Star Wars Story,” “Trumbo”) as Duke Weaselton, Shakira as the socially minded international pop star Gazelle, Raymond Persi (“Wreck-It Ralph,” WDAS story artist) as Flash the sloth, Maurice LaMarche (“Pinky and the Brain,” two-time Emmy® winner “Futurama”) as Mr. Big, Tiny Lister (“Friday,” “The Fifth Element”) as Finnick, John DiMaggio (Fox’s “Futurama,” Cartoon Network’s “Adventure Time”) as Jerry Jumbeaux Jr., Katie Lowes (ABC’s “Scandal,” “Big Hero 6”) as Dr. Badger, and Jesse Corti (“Frozen,” “Beauty and the Beast”) as Mr. Manchas. The film is also supported by an emotional and powerful music score created by Michael Giacchino (“Jurassic World,” Academy Award®-winning composer for Disney•Pixar’s “Up”) and an inspiring original song, “Try Everything,” performed by Grammy®-winning, international superstar Shakira (voice of Zootopia’s biggest pop star, Gazelle) and written by Grammy®-winning singer-songwriter Sia and songwriting duo Stargate. making-of featurettes and deleted scenes. 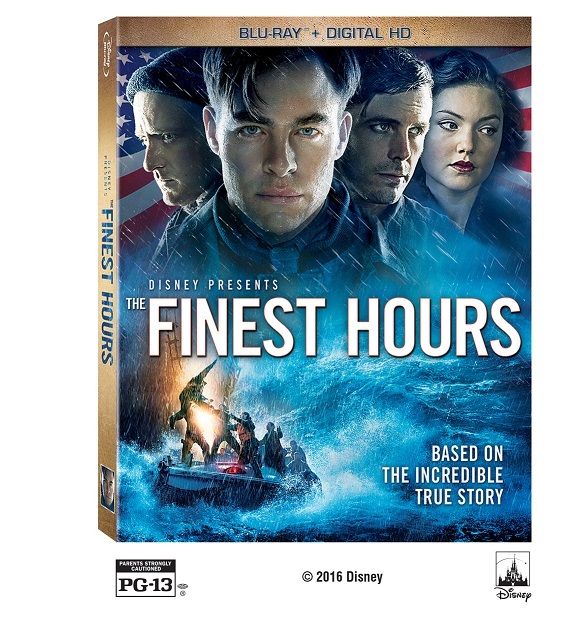 BURBANK, Calif., March 25, 2016 — “THE FINEST HOURS,” a heroic action-thriller based on the true story of a 1952 U.S. Coast Guard rescue, storms home on Blu-ray Combo Pack, Digital HD, Disney Movies Anywhere, and On-Demand on May 24th, 2016. Starring Chris Pine (the “Star Trek” films), Academy Award® and Golden Globe® nominee Casey Affleck (“Interstellar”), Ben Foster (“3:10 to Yuma”) and Eric Bana (“Lone Survivor”), “THE FINEST HOURS” makes its in-home debut packaged with a host of bonus features about the making of the movie and the remarkable true-life events that inspired it. Based on the acclaimed non-fiction book of the same name by Casey Sherman and Michael J. Tougias, viewers can enjoy diving into the thrilling eye of the storm with: An all-new documentary “Against All Odds: The Bernie Webber Story,” in which real-life residents of Chatham recall the events that set the stage for the film’s historic rescue mission; Four making-of featurettes highlighting cast members experiences and reflections by members of the U.S. Coast Guard; as well as two never-before-shared Deleted Scenes. Directed by Craig Gillespie (“Million Dollar Arm”), “THE FINEST HOURS” stars Chris Pine (the “Star Trek” films); Academy Award® and Golden Globe® nominee Casey Affleck (“Interstellar”); Ben Foster (“3:10 to Yuma”); Holliday Grainger (“Cinderella”); John Ortiz (“Silver Linings Playbook”); and Eric Bana (“Lone Survivor”). The film is produced by Jim Whitaker (“Cinderella Man”) and Dorothy Aufiero (“The Fighter”), the screenplay is by Oscar® nominee Scott Silver (“8 Mile”) and Oscar nominees Paul Tamasy & Eric Johnson (“The Fighter”) based on the acclaimed non-fiction book of the same name by Casey Sherman and Michael J. Tougias. Doug Merrifield (the “Pirates of the Caribbean” films) serves as executive producer. Against All Odds: The Bernie Webber Story – Visit the quaint and close-knit town of Chatham, and experience the events surrounding the most heroic Coast Guard rescue ever through the eyes of the people who witnessed them. This heroic action-thriller is based on the extraordinary true story of the greatest small-boat rescue in Coast Guard history. In 1952, a massive winter storm strikes off the coast of Cape Cod, ripping a T-2 oil tanker in half and trapping more than 30 sailors inside its rapidly sinking stern. When word of the disaster reaches the U.S. Coast Guard, four men led by Captain Bernie Webber (Chris Pine) set out in a 12-seat boat on a daring mission to rescue the stranded men, braving freezing cold, 60-foot waves and hurricane-force winds, and guided by Webber’s vow that “We all live, or we all die.” Packed with thrilling, larger-than-life action and anchored in a belief in the strength of the human spirit, The Finest Hours is a triumph. When you SEE ”CHOOSE YOUR SIDE” on TV5 - Call BATV at 860-243-9710- be the 5th caller!! Anthony & Joe Russo are directing with Kevin Feige producing. 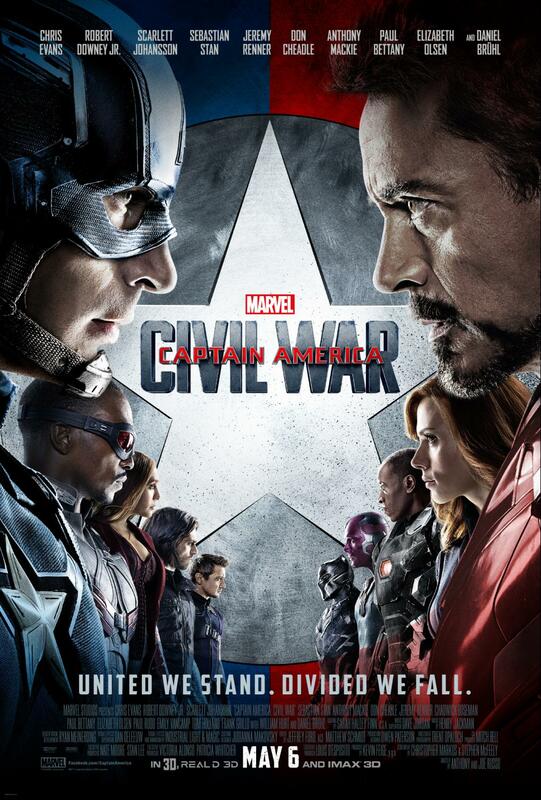 Louis D’Esposito, Victoria Alonso, Patricia Whitcher, Nate Moore and Stan Lee are the executive producers. The screenplay is by Christopher Markus & Stephen McFeely. Get ready to pick a side and join the nonstop action playing out on two fronts when Marvel’s “Captain America: Civil War” opens in U.S. theaters on May 6, 2016! NO PURCHASE NECESSARY. Limit two (2) admit-one passes per person. This film is rated PG-13. Must be 13 years of age or older to receive passes. Employees of all promotional partners and their agencies are not eligible. Void where prohibited. Seating is first-come, first-served basis. SEATING IS LIMITED, SO ARRIVE EARLY. PASS DOES NOT GUARANTEE A SEAT AT THE SCREENING. Watch BATV from March 29th to April 5th for your chance to win The Walt Disney Studios and Lucasfilm’s upcoming in-home release of STAR WARS: THE FORCE AWAKENS, available on Blu-ray Combo Pack and DVD on April 5th and featuring an in-depth documentary and bonus material that will take fans on an exciting journey behind the scenes; secrets will be revealed through extensive footage, never-before-seen deleted scenes, and exclusive interviews with the actors and filmmakers. Brand New Trailer Now Available! 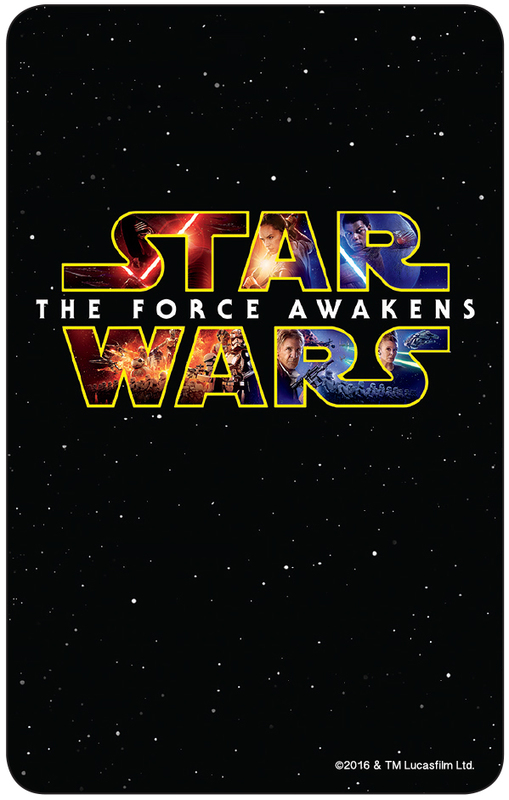 Star Wars: The Force Awakens shattered box office records upon its debut to become the cinematic event of a generation with over $926 million domestic and $2.05 billion worldwide. Now, the epic movie will be available to own early on Digital HD and Disney Movies Anywhere on April 1. It comes home on Blu-ray Combo Pack and DVD on April 5. · Secrets of The Force Awakens: A Cinematic Journey – For the first time, discover the complete story behind the making of The Force Awakens, revealed through in-depth footage and exclusive interviews with the actors and filmmakers in this feature documentary. · The Story Awakens: The Table Read – Cast members familiar and new reflect on the memorable day they all first came together to read the movie’s script. · Building BB-8 – See how the filmmakers brought the newest droid to the screen, creating an instant fan favorite in the Star Wars universe. · Crafting Creatures – Watch movie magic as the filmmakers bring a cast of new creatures to life. · Blueprint of a Battle: The Snow Fight – Go deeper into the epic, climactic lightsaber battle between Rey and Kylo Ren. · John Williams: The Seventh Symphony – The legendary composer shares personal insights of his work on Star Wars and The Force Awakens. · ILM: The Visual Magic of The Force – An insider’s look into the remarkable digital artistry of the movie’s visual effects. · Force For Change – Heroes come in all shapes and sizes. See how the Star Wars: Force for Change initiative has united Star Wars fans all over the globe to help others. FEATURE RUN TIME: Approximately 136 min. Lucasfilm and visionary director J.J. Abrams join forces to take you back again to a galaxy far, far away as Star Wars returns to the big screen with Star Wars: The Force Awakens. The film stars Harrison Ford, Mark Hamill, Carrie Fisher, Adam Driver, Daisy Ridley, John Boyega, Oscar Isaac, Lupita Nyong’o, Andy Serkis, Domhnall Gleeson, Anthony Daniels, Peter Mayhew and Max Von Sydow. Kathleen Kennedy, J.J. Abrams and Bryan Burk are producing with Tommy Harper and Jason McGatlin serving as executive producers. The screenplay is written by Lawrence Kasdan & J.J. Abrams and Michael Arndt. ONE (1) pair of tickets to the 10th caller, starting at 9am, to the BATV Studios. This contest runs each day from Monday, January 26th to Friday, January 30th. 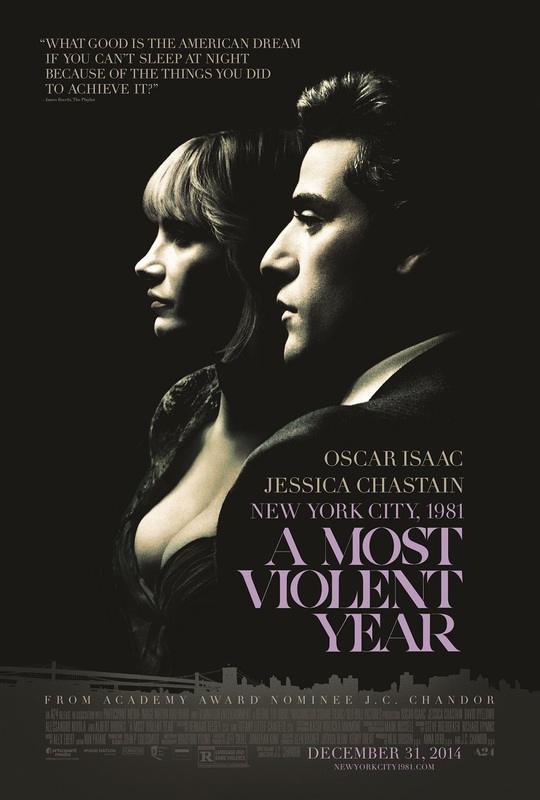 A MOST VIOLENT YEAR is a searing crime drama set in New York City during the winter of 1981, statistically the most dangerous year in the city’s history. From acclaimed writer/director J.C. Chandor, and starring Oscar Isaac (INSIDE LLEWYN DAVIS) and Jessica Chastain (ZERO DARK THIRTY), this gripping story plays out within a maze of rampant political and industry corruption plaguing the streets of a city in decay. J.C. Chandor’s third feature examines one immigrant’s determined climb up a morally crooked ladder, where simmering rivalries and unprovoked attacks threaten his business, family, and - above all - his own unwavering belief in the righteousness of his path. With A MOST VIOLENT YEAR, Chandor journeys in a bold new direction, toward the place where best intentions yield to raw instinct, and where we are most vulnerable to compromise what we know to be right. See the most SPECTACULAR movie of the summer! Passes are good Mon. - Thurs. (excluding holidays) beginning Monday, August 26 at Bowtie Palace 17 & Odyssey Theater through the film's run of engagement. 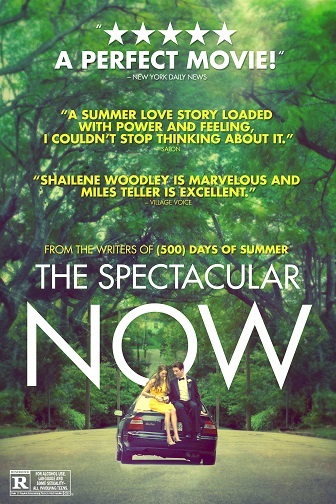 With sly humor and an intensity of feeling, THE SPECTACULAR NOW creates a vivid, three- dimensional portrait of youth confronting the funny, thrilling and perilous business of modern love and adulthood. This is the tale of Sutter Keely (Miles Teller), a high school senior and effortless charmer, and of how he unexpectedly falls in love with "the good girl" Aimee Finecky (Shailene Woodley). What starts as an unlikely romance, becomes a sharp-eyed, straight-up snapshot of the heady confusion and haunting passion of youth - one that doesn't look for the tidy truths. The film was written by Scott Neustadter and Michael Wever (500) DAYS OF SUMMER and is based on the book, The Spectacular Now, by Tim Tharp. This film also features wonderful supporting turns from Bri Larson, Kyle Chandler, Jenifer Jason Leigh and Mary Elizabeth Winstead. Get ready for non-stop action in the all-new thrill ride, DEATH RACE 3: INFERNO, starring Luke Goss and Danny Trejo. On Blu-ray & DVD January 22. Repentant convict Carl Lucas – also known as Frankenstein – is a legendary drive facing his toughest competition: the first-ever desert Death Race. Frankenstein is only one victory away from winning freedom, and in South Africa’s infernal Kalahari Desert, he takes on ruthless adversaries who’ll stop at nothing to ensure his defeat. Own DEATH RACE 3: INFERNO January 22. Only from Universal Studios Home Entertainment. OVERVIEW: “Smash” Season One tells the compelling story of a heated rivalry between upcoming starlets, a writing team in need of a new hit and a Broadway producer finding her own way in a “captivating fusion of music, dance and potent storytelling” (Dorothy Rabinowitz, Wall Street Journal). From executive producer Steven Spielberg (Jaws, Schindler’s List) comes the groundbreaking, critically acclaimed series “Smash,” Emmy Award® winner for Best Choreography. Starring Emmy Award® winner Debra Messing (Will & Grace), Academy Award® winner Anjelica Huston (Prizzi’s Honor), Megan Hilty (Broadway’s Wicked) and American Idol’s Katharine McPhee, “Smash” Season One is available on DVD with UltraViolet™ on January 8, 2013. Experience all 15 “gloriously entertaining” (Robert Bianco, USA Today) episodes back-to-back and uninterrupted in this four-disc set, filled with fantastic musical performances, stunning production numbers and scandalous backstage dramas. Fans can also see never-before-seen bonus features including deleted scenes, featurettes and much more! “Smash” Season One includes an UltraViolet™ copy of each episode. UltraViolet™ is the revolutionary new way for consumers to collect movies and TV shows in the cloud to instantly stream and download to tablets, smartphones, computers and TVs. Consumers can now enjoy “Smash” Season One anytime, anywhere on the platform of their choice. • SONG & DANCE: Go behind the scenes with composers Marc Shaiman and Scott Wittman as we take a look at how the original music is created for the show and see choreographer Joshua Bergasse put the cast and dancers through their paces as both song and dance come to life! • UltraViolet™: The revolutionary new way for consumers to collect movies and TV shows, store them in the cloud and instantly stream and download to TV’s, computers, tablets and smartphones. Consumers can now truly enjoy their movies anytime, anywhere on the platform of their choice. Currently available in the United States only. Burbank, Calif., January 3, 2013 – Walt Disney Animation Studios announces the debut of the hit arcade-game-hopping adventure “Wreck-It Ralph” marking a Disney first with the early release of the HD Digital and HD Digital 3D on February 12, 2013, followed by the 4-Disc Blu-ray Combo Pack, 2-Disc Blu-ray Combo Pack, DVD, SD Digital and On-Demand release on March 5, 2013. From Walt Disney Animation Studios, “Wreck-It Ralph” takes viewers on a hilarious journey. For decades, Ralph (voice of John C. Reilly) has played the bad guy in his popular video game. In a bold move, he embarks on an action-packed adventure and sets out to prove to everyone that he is a true hero with a big heart. As he explores exciting new worlds, he teams up with some unlikely new friends including feisty misfit Vanellope von Schweetz (voice of Sarah Silverman). The film is directed by Emmy®-winner Rich Moore. Featuring an all-star voice cast including Jack McBrayer as the voice of Fix It Felix, Jr. and Jane Lynch as the voice of Sgt. Calhoun, plus breakthrough bonus features that take viewers even deeper into the world of video games, Disney’s “Wreck-It Ralph” has something for every player. Over an hour of all-new bonus material is featured on the Digital and Blu-ray Combo Pack, including deleted and alternate scenes, the theatrical short “Paperman,” plus much more. 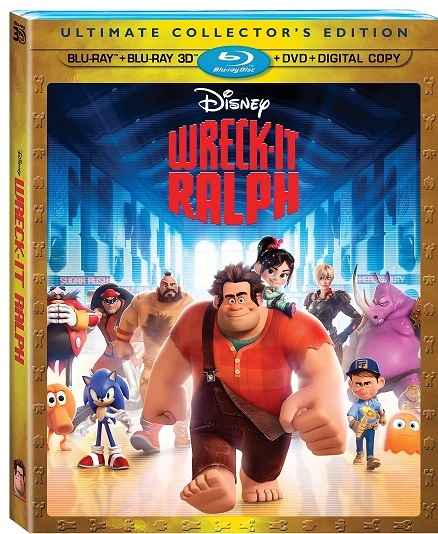 The home entertainment debut of “Wreck-It Ralph” will be available in multiple ways, containing exciting all-new bonus features that extend the fun-filled movie experience. Universal City, California, October 18, 2012— On the verge of having their conspiracy exposed, members of the government’s intelligence community will stop at nothing to erase all evidence of their top secret programs in The Bourne Legacy, coming to Blu-ray™ Combo Pack, DVD and On Demand December 11, 2012 from Universal Studios Home Entertainment. The film is also available via Digital Download. Inspired by master storyteller Robert Ludlum’s immensely popular books, The Bourne Legacy takes the action-packed Bourne series to an explosive new level. With his life in jeopardy, agent Aaron Cross (Jeremy Renner) must use his genetically-engineered skills to survive the ultimate game of cat-and-mouse and finish what Jason Bourne started. 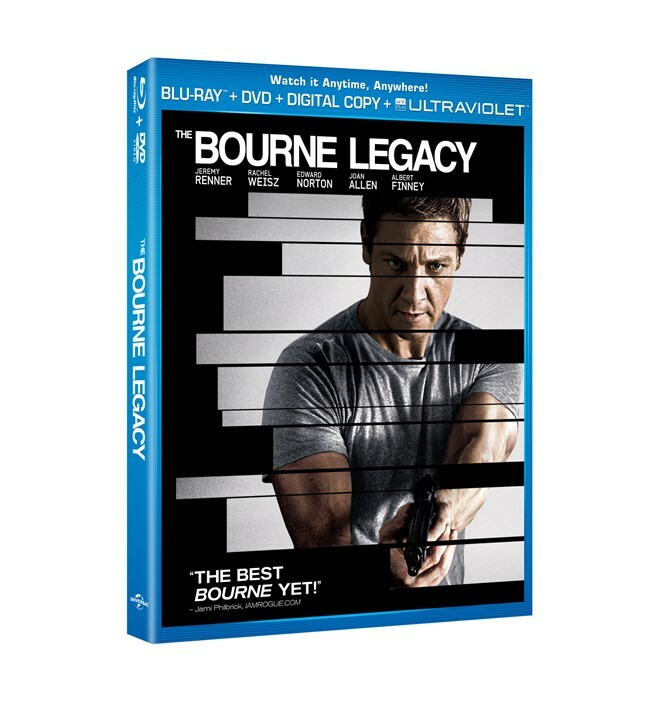 Presented in incomparable high-definition picture and perfect DTS master audio 7.1 surround sound, The Bourne Legacy Blu-ray™ includes an array of behind-the-scenes bonus features that take viewers inside the making of this global action-thriller. For more than a decade, movie audiences worldwide have been enthralled by undercover agent Jason Bourne. A compelling mixture of riveting suspense, breathtaking action and shocking intrigue, The Bourne Legacy is the next thrilling original chapter in the hugely popular espionage franchise that has earned over $1 billion at the global box office. Director Tony Gilroy (Michael Clayton), screenwriter for the entire Bourne film series, steps behind the camera for the fourth installment. The film features a distinguished cast of compelling new faces and Bourne film favorites including Academy Award® nominee Jeremy Renner (The Avengers, The Hurt Locker), Academy Award® winner Rachel Weisz (The Mummy, The Constant Gardener), Academy Award® nominee Edward Norton (The Incredible Hulk, Moonrise Kingdom), Stacy Keach (American History X, W.), Academy Award® nominee Joan Allen (The Bourne Supremacy, The Contender), Academy Award® nominee Albert Finney (The Bourne Ultimatum, Erin Brockovich), Academy Award® nominee David Strathairn (The Bourne Ultimatum, Good Night, and Good Luck) and Scott Glenn (The Bourne Ultimatum, Training Day). The screenplay was co-written by Dan Gilroy and produced by Frank Marshall, Patrick Crowley, Jeffrey M. Weiner and Ben Smith. The Blu-rayTM Combo Pack contains a Blu-rayTM, DVD and Digital Copy of the film, compatible with iPhone®, iTunes®, iPad®, iPod®, iPod® touch, Android™ and online retailer partners as well as UltraViolet™. UltraViolet™ is the revolutionary new way for consumers to collect movies and TV shows in the cloud to instantly stream and download to tablets, smartphones, computers and TVs. Consumers can now truly enjoy The Bourne Legacy anytime, anywhere on the platform of their choice. The #1 Comedy of the year! Take Home the Unrated Edition Of One Of the Top 3 R-Rated Comedies of All Time! Available on Blu-Ray™ Combo Pack Including UltraViolet™, DVD & Digital Copy With Hilarious Deleted Scenes, Alternate Takes, a Gag Reel & More! Seth MacFarlane, creator of television’s uproarious and irreverent hits “Family Guy,” and “American Dad,” Ted stars Mark Wahlberg (Contraband, The Other Guys), Mila Kunis (Friends with Benefits, Black Swan), Joel McHale (“Community”), Giovanni Ribisi (Contraband, Avatar) and Seth MacFarlane as the voice of Ted. Norah Jones and newcomer Brett Manley. 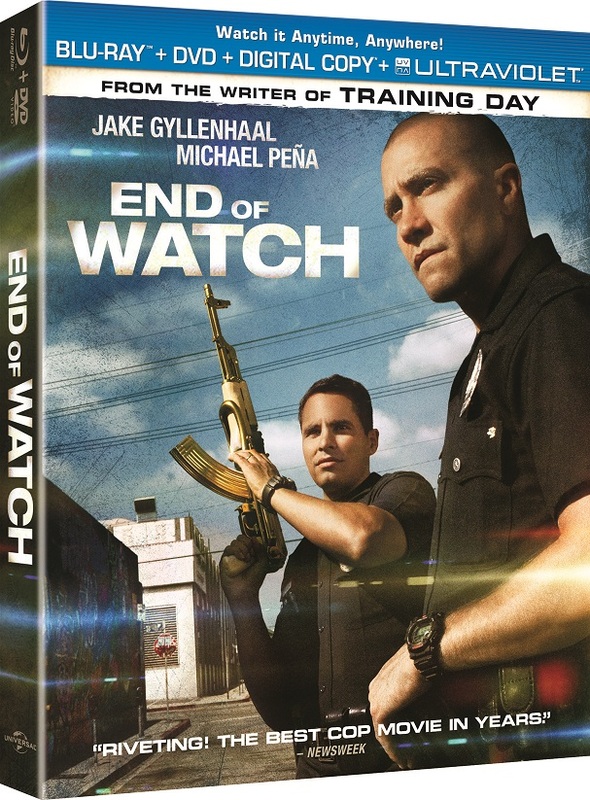 Both the Blu-ray™ Combo Pack and DVD feature an unrated extended version of the film – featuring laugh-out-loud footage not shown in theaters – a gag reel, feature commentary with Seth MacFarlane and Mark Wahlberg and an insider’s look at the making of the funniest buddy picture ever made. Ted’s outrageous, off-color antics won the hearts and minds of critics and audiences alike, with Peter Travers of Rolling Stone declaring the movie “hysterically funny” and Trey Alexander of Fandango.com calling it “an instant classic.” A critically hailed blockbuster that took in more than $218 million in North America alone, Ted is the third highest grossing R-rated comedy of all time and scored the highest debut ever for an original R-rated comedy. Exclusively on the Ted Blu-ray™ Combo Pack are bonus features that include deleted scenes, alternate takes and a behind-the-scenes look at the creation of Ted’s already legendary fight scene. The Ted Blu-ray™ Combo Pack also includes a Digital Copy of the film, compatible with iPhone®, iTunes®, iPad®, iPod®, iPod® touch, Android™ or online retail partners, as well as UltraViolet™. UltraViolet™ is the revolutionary new way for consumers to collect movies and TV shows in the cloud to instantly stream and download to tablets, smartphones, computers, and TVs. Consumers can now truly enjoy Ted anytime, anywhere on the device of their choice. Ted – The Making Of: Profiling the story of the film from inception to completion, this three-part documentary is filled with interviews and behind-the-scenes footage showcasing the entire cast and crew. Feature Commentary: Director and co-writer Seth MacFarlane, co-writer Alec Sulkin and star Mark Wahlberg participate. Teddy Bear Scuffle: Watch how the filmmakers choreograph the awesome and hilarious Motel 6 fight scene between Mark Wahlberg and Ted. Disney brings to life an iconic hero, John Carter, in a visually stunning new world with heart-pounding action. 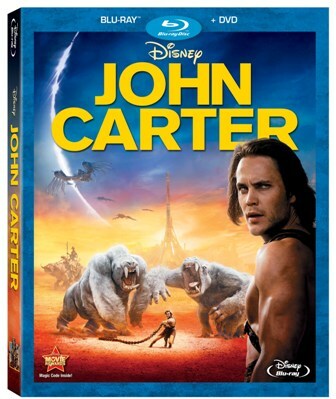 The heroic epic adventure “John Carter” arrives on Disney Blu-ray Combo Pack, Blu-ray 3D™, HD Digital, DVD and On-Demand June 5, 2012, just in time for Father’s Day! As a warrior lost on Earth, John Carter is magically transported to Mars, where the fate of the planet and its people ultimately rest in his hands. With surprising new powers, and epic battles, he rises to become the man he is meant to be and the hero he truly is. From Academy Award®-winning filmmaker Andrew Stanton (Best Animated Film, WALL•E, 2008) “John Carter” is a sweeping action-adventure set on the mysterious and exotic planet of Barsoom (Mars). John Carter is a war-weary, former military captain who’s inexplicably transported to Mars and reluctantly becomes embroiled in an epic conflict. It’s a world on the brink of collapse, and Carter rediscovers his humanity when he realizes the survival of Barsoom and its people rests in his hands. llapse, and Carter rediscovers his humanity when he realizes the survival of Barsoom and its people rests in his hands. Stunning special effects, great characters and villains — and complete with extraordinary bonus features — “John Carter” is a heroic and inspirational adventure that will thrill audiences beyond imagination. This ambitious and unforgettable screen adaptation of the classic novel “A Princess of Mars” by Edgar Rice Burroughs, stars heartthrob Taylor Kitsch (“Friday Night Lights,” “X-Men Origins: Wolverine”) in the title role, Lynn Collins (“X-Men Origins: Wolverine,” “The Number 23”) as Dejah Thoris, Willem Dafoe (“The English Patient,” “Spider Man”) as Tars Tarkas, and Dominic West (“300,” “The Wire”) as Sab Than. “John Carter” will be available to own and for in-home viewing as follows:The screenplay is written by Stanton, Mark Andrews and Michael Chabon.